Looking for something fun to enjoy with the whole family? Check out these great suggestions fit for children of all ages. Ready, Set, Go! Start waving the checkered flag because you will be zooming past your competition at the Autobahn Indoor Speedway--European style indoor go-karting! Bowl a frame of two in the state-of-the-art boutique bowling alley at Main Event. The 50,000 square foot entertainment complex also has an arcade, laser tag, delicious dining and other attractions. Experience the thrill as you skydive indoors at iFLY. Learn how to fly as you rise high in the air in the iFLY wind tunnel. Welcome flyers as young as 3 years old. Take a ride on the St. Johns River Ferry, connecting Mayport to Fort George Island. Here you’ll find nature and history abound. Discover unspoiled beaches and sharks teeth at Talbot Island State Parks or take a step back in time at Kingsley Plantation, Florida’s oldest plantation house. Let the kids run wild at Adventure Landing. Families can play in the mega-arcade, race around the go-kart track, engage in friendly competition in the laser tag arena or play a little mini golf. There are two locations in town. Kids of all ages will get a kick out of Dave and Buster's, a restaurant, bar and entertainment complex with the "Million Dollar Midway," featuring more than 200 interactive video games. Visit the Museum of Science & History’s (MOSH) Bryan Gooding Planetarium – it's Florida’s largest! Shows range from Sesame Street to Cosmic Concerts, so there’s something for every age. Travel across the bridge to the Museum of Contemporary Art Jacksonville (MOCA) for the ArtExplorium Loft where children and adults will enjoy exploring 16 fun and interactive stations that link basic visual art principles with works in the MOCA collection. It’s a must for anyone visiting MOCA’s fifth floor. Make your own candy, guided by Pete himself or taste the adventurous organic cotton candy flavors at Sweet Pete’s in Downtown Jacksonville. The Willie Wonka-inspired factory and all-natural treats are ideal for families. Discover a much-loved attraction, the Jacksonville Zoo and Gardens. A true family adventure, the Zoo and Gardens is growing and changing daily and is dedicated to consistently improving. The newest attraction is the African Forest! Don’t forget to feed the giraffe’s or splash in the splash ground. Paddle you way through Jacksonville waterways on a kayak ride with Kayak Amelia. Kayaking guided tours are offered numerous times throughout the week, allowing nature enthusiasts to get an up close look at the wildlife surrounding the Timucuan Preserve. Segway tours are available too! Take me out to the ballgame! The Double A Baseball Affiliate of the Miami Marlins, The Jacksonville Jumbo Shrimp play April through September. The Shrimp have incredible promotions like 50 cent family feast night and Friday night fireworks. And there’s always entertainment in the outfield for the kids with bounce houses and playground. Lions, Tiger and other big cats call Catty Shack Ranch Wildlife Sanctuary home. Click here for the next tour or event. If your timing is right book your spot for the Roar 'n Snore campout or their Halloween Haunted Forest in October. Kids Free November is Jacksonville's city-wide promotion offering discounted admission to top family attractions during the entire month of November. Don't miss it! Winter on the Water in Jacksonville offers a variety of family friendly events, see our can't miss events below and start to penciling in your plans! A few favorite winter activities include: the Jacksonville Light Boat Parade and Fireworks on the St. Johns River, ZOOLights at the Jacksonville Zoo and Gardens and WinterFEST at Adventure Landing. 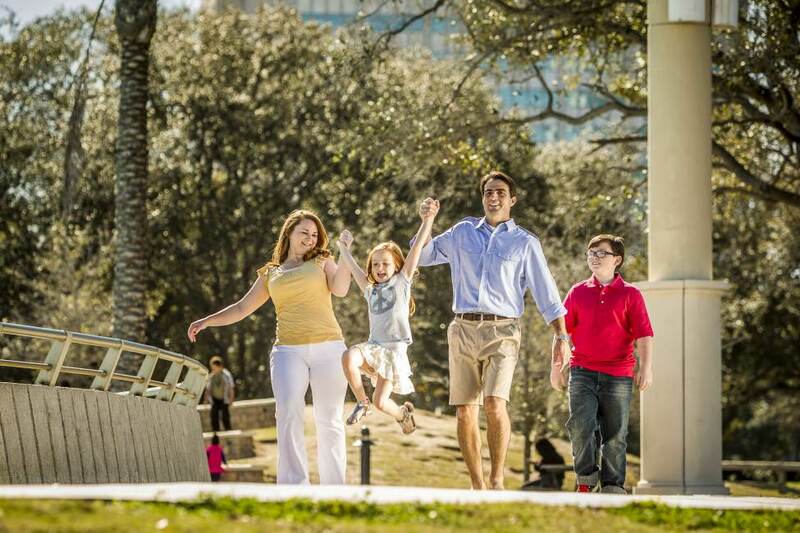 Bring the Family to Jax and make lifelong memories!